In the most extreme cases, excessive clutter leads to hoarding, which causes significant stress of many kinds, including emotional, physical, social, financial and legal. According to the Anxiety and Depression Association of America, hoarding is characterized by a persistent inability to get rid of possessions, including items of little value like newspapers, plastic bags and boxes. If I told you your precious stuff was going straight to a dump, would you want to get rid of it? Of course not! When you’re parting with sentimental items, it can be easier to let go if you know that you’ll be enriching someone else’s life with your possessions. You can positively impact your local community by donating your unused items to a shelter, having a yard sale or listing items on your local Craigslist. You can also upcycle, recycle or sell your stuff on eBay. Before you declutter each room, decide how you want the space to look. Before we get started, make sure to visualize the goal you have in mind. Do you want your home to smell better? Do you want more space? Do you want your guests to feel welcomed in your home? Think mindfully about the end result that you desire. Set an intention, that way you can stick to your guns when you’re having a hard time trying to decide whether or not to toss something. Prepare and label four bins: keep, donate, trash and maybe. As you move through each room during the challenge, assign each item to a bin. If you’re unsure, put your item in the “maybe” bin. When you’ve gone through everything, go back through the “maybe” bin and re-assign every item to the “keep” “donate” or “trash” bin. It’ll get easier each time you do it, promise. Since bathrooms are usually the smallest rooms in the house, we’ll begin here. Start by scanning the counter. Can you get rid of knick-knacks, old candles or unnecessary decorations? Free up counter space, if possible. Now go through each drawer. Check the expiration dates on everything. Toss any beauty items or makeup that have been sitting there for more than six months. Look through your linen closet — do you really need 15 towels? How about 10 sets of sheets? Depending on the size of your family, you can probably get away with a lot less than you think. Still starting small, our cars can usually be tackled in just an afternoon after work. Is there stuff that’s been sitting in your trunk for years? Time to sort it out. Do you have a collection of CDs that you never listen to anymore? How about the papers in your glove box? Sort, sort and sort some more. 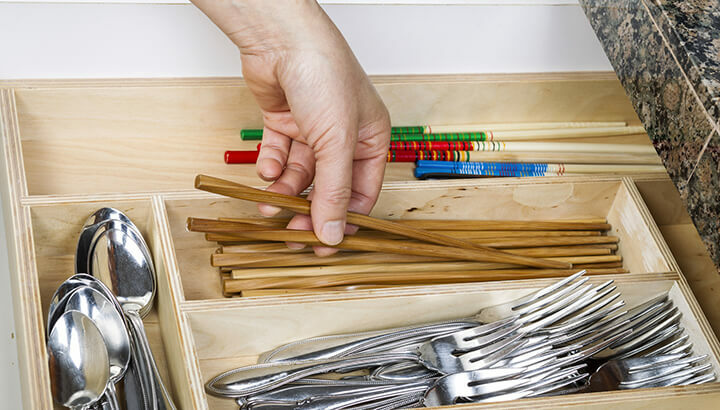 Declutter your kitchen by going one through one drawer at a time. The kitchen will probably be tougher than the bathroom and car, but well worth the effort. Can you part with some of your silverware? Unused china? How about the old appliances collecting dust on top of your fridge? Make sure to sort through your pantry too, and the side drawers of your fridge with old dressings and condiments. Check the expiration dates on all of your canned goods. If they’re still good, consider donating them to a homeless shelter (you don’t need the BPA from canned goods, anyway). When guests come to visit, your living room sets the tone. What impression are you trying to make? Cozy and warm? Sleek and stylish? Evaluate the items in your space, and the feng shui, to see if you can make improvements. If you have way more seats than people, consider getting rid of some furniture. Have you stopped watching DVDs because of Netflix? Sell or donate old movies. Is your collection of books looking cluttered and chaotic? Donate the ones you’ve never read or don’t intend to read in the next six months. Then, organize the remaining few from tallest to shortest — you’ll love how clean it looks. Our offices are an extension of our homes, and our cleanliness habits tend to carry over. While some research suggests that a messy space can boost creativity, there are several studies that say clutter does just the opposite. How many pens in your pen holder still work? Toss the ones that don’t. Do you really need 100 paper clips? Donate some to your office mates. Can you find a way to free up the table space around your computer? Make sure you have plenty of elbow room. If you don’t work in a traditional office, see if you can simplify your work station — whatever kind it is. You may just see your productivity shoot through the roof. 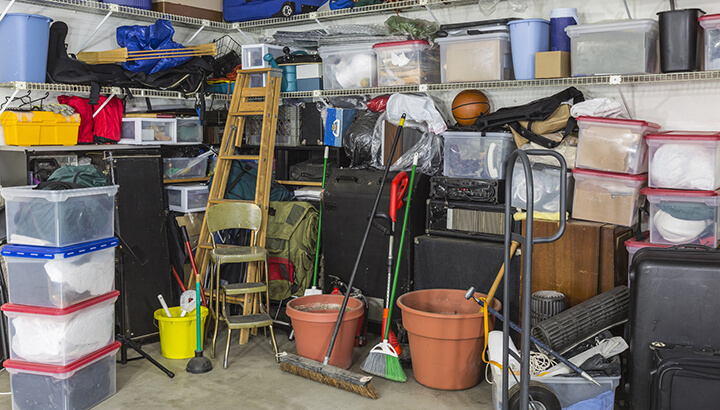 Declutter your garage with the whole family for best results. Ah, the weekend. Time to take everything you’ve learned this week and apply it to the most challenging, and probably cluttered, space yet: the garage. Make sure you can dedicate several hours to this task, as you’re going to find things you haven’t seen in years. Can you part with old sporting equipment? How about a box of trophies or unused art supplies? This would be a great time to enlist the help of your family or friends. Make a whole day of it, with snacks, music and sharing the amusing items you discover. After a project like the garage, it’s time to take an easy day. In the dining room, focus on the essentials that will provide the right ambiance for dinner with your family and guests. Do you need more than one centerpiece? How about five sets of placemats? Remove anything from the table not related to dining, like paperwork, toys, clothes or small loose items. Our dining rooms are a special place for two of our favorite pastimes: relaxing and eating. Make sure to honor it that way! Here’s an often overlooked room in the house, but once that collects lots of loose socks, lint and knick-knacks found in pockets. Take the time to find a home for everything that’s ended up in this room. Leave only the basics: all-natural laundry detergent (like soap nuts), dryer sheets and homemade cleaning supplies. If you’ve been neglecting your washer and dryer lately, take a few moments to spruce them up, wiping off dried soap or emptying out the lint trap. Shouldn’t a room that’s meant to clean things be clean itself? We think so! Okay, now we’re moving back into tricky territory. Kids have a way of accumulating toys and clothes like nobody’s business, which is all the more reason to teach them lessons about minimalism early on. Together, start with one drawer, or shelf, at a time to prevent getting overwhelmed. Donate anything that’s no longer age appropriate. Go for quality, not quantity. For example, of all of the toys, which are likely to last the longest? Keep those. For items that are on the way out, reassure your kids that they will be making someone else very happy with their donation. For “maybe” items, ask your kids why they still want or need them — you might be surprised by what they share! If you don’t have kids, spruce up your guest bedroom or, hey, take a day off. After nearly two weeks, you must be getting pretty good at decluttering — but now it’s time to put those skills to the test! Your master bedroom probably contains all of your most prized possessions, the things that you want to see every day. For a moment, consider the purpose of your master bedroom. Is it for entertainment? Maybe, but the living room also works for that purpose. Is it for storage? Perhaps, but the garage might serve that need better. Scale back your belongings to enhance the overall purpose of your bedroom. It should be for relaxation, intimacy with your partner and, of course, sleep. Keep the candles, relocate the TV set. Keep the plants, toss the paperwork. You get the idea. During the cold winter months, you probably didn’t spend much time outside, so now it’s time to see what has accumulated outdoors. Unwind after work with some fun in the sun, while taking an inventory of your backyard belongings. From patio furniture to lawn ornaments, gardening equipment to dog toys, you can probably stand to toss a thing or two. If your grill is collecting rust, dust and cobwebs, for example, maybe it’s time that it found another home. As you’re getting rid of things, focus on optimizing your outdoor space for summer meals, play time, arts and crafts or any other fun family activities. 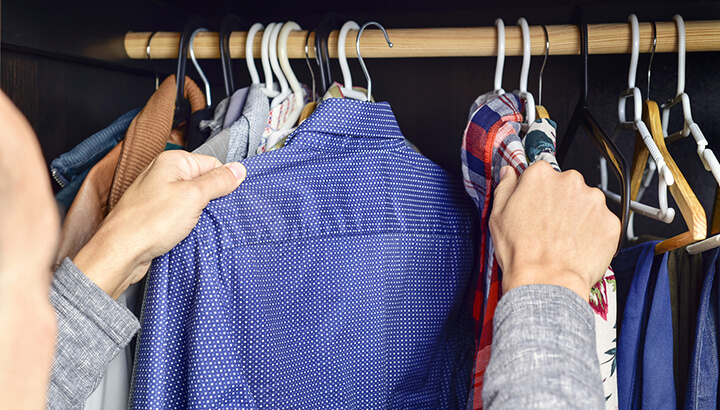 Declutter your closet, one piece of clothing at a time. When we have things we don’t need, it’s easy enough to just stick them in the back of the closet and forget they are there. Out of sight, out of mind, right? The problem is, when we do this over and over again, we lose track of everything we have — including clothes! This opens us up to spending more money on things we absolutely do not need. Now that you’ve gotten really good at evaluating and prioritizing your stuff, we’ve saved the hardest for last. Spend the weekend sorting through your closets, storage rooms, storage units and any other small rooms in your house. If you haven’t used an item in six months, let it go. If it hasn’t fit on your body in a year, toss it aside. If you have no idea where you got it from, say goodbye. The more you do this, the more efficient you will get. Make grocery lists and stick to them! Practice the one-in, one-out rule. If you buy a new book, donate an old book. If you buy a new dress, donate an old dress, and so on. Wait a week before you purchase something big. With Amazon and other online shopping outlets, it’s more difficult than ever to refrain from instant checkouts. Refrain from impulse buys when you’re checking out at the store. Remember, stores pay marketers a lot of money to figure out how to get that silly stuff inside your home. You are wiser now! And there you have it. With some serious dedication, you can move towards a clutter-free home, car and office. Remember this mantra: clear space, clear mind. Hey Buddy!, I found this information for you: "How To Declutter Your Home For Better Health In Just 14 Days". 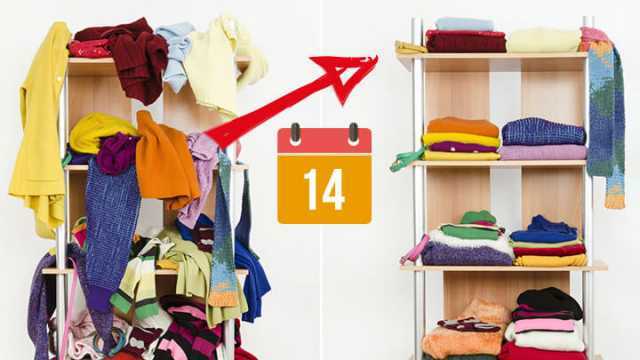 Here is the website link: https://www.thealternativedaily.com/how-to-declutter-home-in-14-days/. Thank you.